Andrew Adonis said Brexit was ‘a dangerous populist and nationalist spasm worthy of Donald Trump’ [Image: Martin Godwin for the Guardian]. Let us be clear from the start: This Writer is not a fan of Andrew Adonis. He was a Blairite who was too keen to introduce the private sector into public service. I’m aware that he regretted introducing tuition fees, but he still went through with the introduction of the policy. So his appointment as “infrastructure tsar” for a Conservative government did not surprise me in the least. His resignation – on the prejudicial terms that have come to light – has. Pleasantly! Put simply, it is hard to see how Lord Adonis could have spoken out more strongly against Mrs May, her government, her legislative strategy and her abilities in general. He’s given her a right old trashing. He has accused Theresa May of being the worst lawmaker to head the United Kingdom since 1963. That’s quite an achievement! This is not meant kindly. He is saying that the voters who gave Brexit its miniscule majority engaged their emotions – not their brains – in doing so, and in so doing, have condemned the United Kingdom to a long period of suffering. He is accusing Mrs May of pushing herself and the Conservative Party to an unacceptably right-wing position politically. There is nothing intelligent about her action or intention, he is saying. She is dismantling the UK’s ability to make its way in the world, with no alternatives lined up to take the place of the current systems. Hard right-wing and Brextremist commentators have already raised issue with the “if” at the start of this sentence. Lord Adonis is saying that Brexit should not happen; that it is the worst possible course of action for the United Kingdom and that we will waste generations trying to win back the ground that a few hard-line jingoistic nationalists are determined to throw away on behalf of the rest of us. He is right. Brexit will be cripplingly damaging. There is no argument against halting it. Saying “We had a democratic vote” means nothing when you add the required caveat “that makes absolutely no sense at all”. For those who are determined to force their version of democracy on us, I like to reference Alan Moore’s classic line about democracy. Suppose every animal on Earth had sentience and was able to vote on what we all had for breakfast, with the result as enforceable as Brexit seems to be for the Brextremists. Human beings would vote for bacon and eggs, or porridge, or some accepted breakfast food, right? And then billions upon billions of ants and other insects would vote for excrement. We would all end up eating sh*t in the name of democracy. That’s a pretty good metaphor for what Brexit will do to the United Kingdom, as everybody with an ounce of sanity knows. 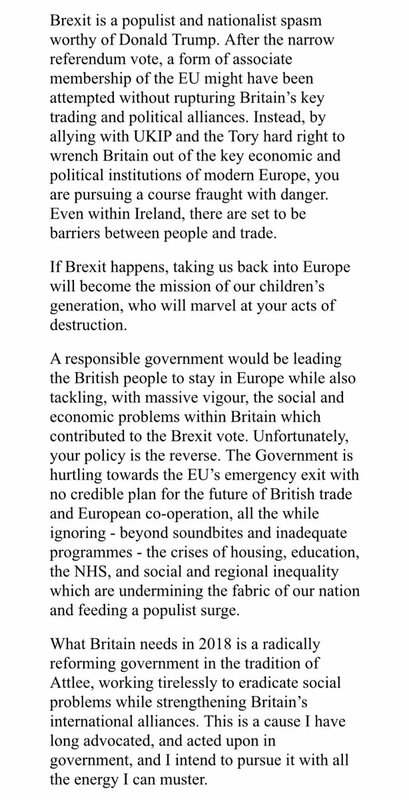 The line about future generations marvelling at Theresa May’s “acts of destruction” may seem pessimistic to some, but Lord Adonis is saying that a certain proportion of the current generation is too blinkered to accept the facts. Future generations won’t have the prejudices of the current age to blind them and will have bitter experience to inform their actions. All in all, therefore – and this is what Lord Adonis is saying – the only sane policy is to scrap Brexit altogether. He’s saying the Conservative government under Theresa May is irresponsible. With regard to Brexit, dangerously irresponsible. Okay, this part is quite involved. In a nutshell, Lord Adonis is saying that the narrow vote in favour of Brexit was informed by the crises mentioned here – in housing, education, the NHS, social and regional inequality. These are all products of almost 40 years of useless neoliberal policies that have dismantled the perfectly capable state system we had before in favour of an anarchic private-enterprise hell in which the rich exploit the poor to their death while telling them immigrants and foreigners are to blame for their predicament. 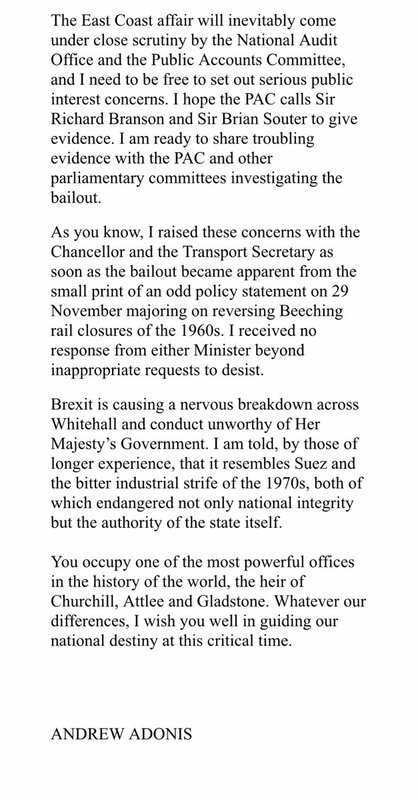 This is a reference to the government’s decision to spend public money bailing out a private company that has tried to run a privatised railway line and failed. The Conservative government is committed to the neoliberal ideology that privatisation produces more efficient and profitable services, but the East Coast rail franchise proves that it doesn’t. This is not acceptable to the Tories so they are determined to sink millions (or perhaps billions) of pounds of your money and mine into keeping it in private hands, rather than simply re-nationalising it, for the good of the country. Note also that Brexit is forcing a reduction in public spending. The Leave campaign swore to us – promised us fervently, day in, day out – that Brexit would provide more money for public services, from the moment the decision was made. Clearly that was a lie. It seems idiotic, therefore, to expect the floodgates to open and money to come pouring into the UK, the moment our departure from the EU takes place. We are going to be poorer – significantly so – after Brexit. Unless you are a company director, you may be driven to extreme poverty. If you voted in favour of that, ask yourself why. If anyone can explain this, please do. It makes no commercial sense whatsoever. A “nervous breakdown”? Yes, that seems accurate. “Conduct unworthy of Her Majesty’s Government”? Yes – David Davis alone bears out that claim. A danger to “the authority of the state itself”? Certainly. 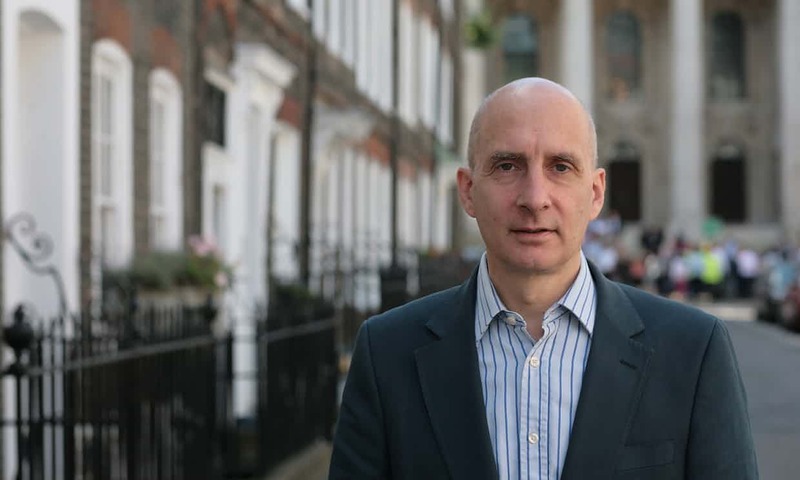 Nobody This Writer knows has anything but contempt for Theresa May, her government, and its conduct – and Lord Adonis, having made exactly the right points, will only deepen that contempt across the UK. He resigned with a strongly worded letter accusing the prime minister of becoming the “voice of Ukip” and pursuing policies that he said would leave Britain in “splendid isolation”. Adonis said he would be “duty bound” to oppose the government’s EU withdrawal bill, which will reach the House of Lords in the new year. He described the bill – the government’s flagship piece of Brexit legislation – as “the worst legislation of my lifetime”. He said Britain could have left the EU, abiding by the result of the 2016 referendum, “without rupturing our essential European trade and political relations”. Instead, the prime minister had “become the voice of Ukip and the extreme nationalist rightwing of your party”. Wow… That’s some letter. Great analysis too, Mike. I remember Andrew Adonis constantly undermining and briefing against Estelle Morris who was Education Secretary at the time. Whatever the rights and wrongs of the situation, Morris had the support and confidence of the teachers and we were sorry to see a good Education Secretary effectively forced out of office by an unelected adviser who became head of Blair’s No 10 policy unit. He was unprincipled and ruthless in pressurising her to go even as Blair tried to get her to stay. A man who is not afraid to speak his mind and one whom I admire for his forthright statement. I always considered Adonis somewhat out of place in the Labour Party, but I agree with this letter wholeheartedly. It’s a shame that people like this guy were prepared to stand by and watch the people f this country, particularly the poor and dependent, be royally screwed by austerity without lifting a finger. I have no doubts that Brexit is a direct result of cuts cuts cuts and the establishments drive to put the blame on anything other than govt. they were so arrogant in their belief that they could always get the result they wanted. The part which I’m sure Adonis doesn’t care about at all is that Brexit will impact far more on those at the bottom of the pile. I disagree. That’s exactly what he’s saying in his letter. Adonis has risen to the challenge this time. It needed to be said, and it needed saying sooner rather than later, before we sink any further in the mire. However, I was a bit sick in my mouth at his denunciation of the ills brought upon us by neoliberalism? HIS work, HIS policies that brought him great personal gain that (until now) has continued under the Tories and coalition, and the great harm they have done. His title was an honour given as a political crony of Blair. Yes, even a broken clock is right twice a day. But I will be watching to see who rushes to align with him now he is no longer a paid-for-promoter of Tory policy. He is now a loose canon within the Labour party and a relic of a time we need to put firmly behind us.